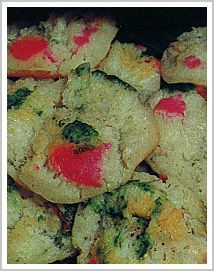 Cara bikang or Indonesian colorful rice flour cake is very beautiful and colorful cake. Very interesting for children eyes and above of all they would like this cake. It’s sweet and tasteful with coconut flavored. It’s a great for snap in the midday or even for dessert, also very suitable for a crowd such as kid’s birthday party or any other occasion. It’s very easy to make and cheap. You don't need much ingredients to make this. So if you’re on low budget but you want still to make a lot of snap without high budget maybe these traditional Asian desserts is the solution that you are looking for. Mix 150 cc coconut milk with 2 tablespoons rice flour. Add some sugar and cook on low fire until you get thick mixture. Set aside. Mix in the bowl the rest of the rice flour and all purpose flour, and add bit by bit the rest of the coconut milk. Knead the dough until they mixed well. And let the dough stand for about 50 or 60 minutes. Take about 100-200 gram out of the mixture and add some food coloring as you like and set aside. Prepare the pan (use muffins baking pan). Preheat the muffin pan for about 15 minutes before you add some mixture in it. After 15 minutes, fill them with the mixture for about 2/3 parts, and add some coloring mixture. Bake until done and the mixture gets holes and dries on the sides. Use small wooden spoon to take them out and they would open like a flower. Paint the bottom of the cakes with some thick coconut milk.